MissionFOTO spent two weeks in Brazil following a work team in the capitol city of Brasilia, photographing the building of a church, and voyaging 100 miles downriver on the Amazon with a medical team conducting examinations among the Satére Indians. The dusty dryness of the high desert near the capitol was difficult, especially for the cameras, but the church was easily erected within the week by the team, dedicated with a mind to build! 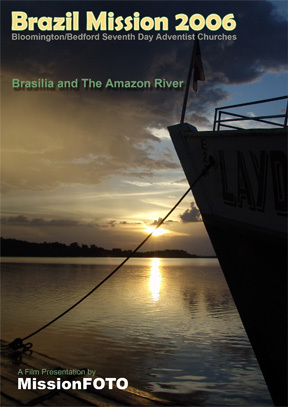 A four hour flight to Manaus brought us to the Amazon River for the medical trek. One morning some young boys in their dugout made it clear that we should not attempt swimming in their “backyard” and reinforced their demand by throwing a near dead piranha into the water adjacent to our boat.